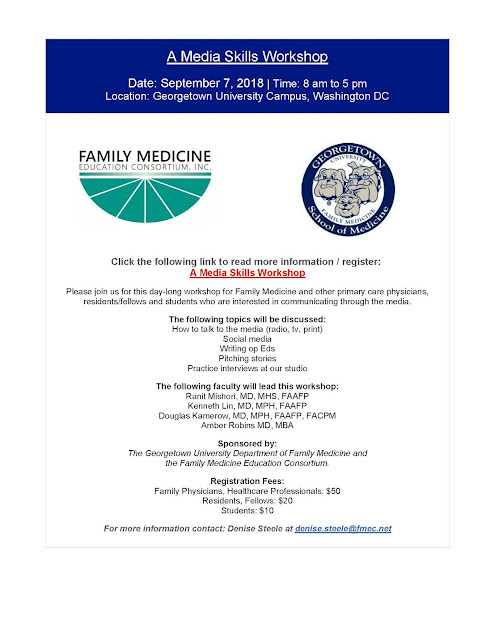 Join me and family physician colleagues Ranit Mishori, Douglas Kamerow, and Amber Robins at Georgetown University on Friday, September 7 for a day-long Media Skills Workshop sponsored by the Family Medicine Education Consortium and our Department of Family Medicine. Pre-registration is available through September 1, and lunch will be provided. Don't miss this opportunity to learn best practices for interacting with the media and how to advocate for patients and primary care in Op-Eds, blog posts, and Twitter!